Alex Tabarrok with a revealing, US-centric post. So what do they actually do? 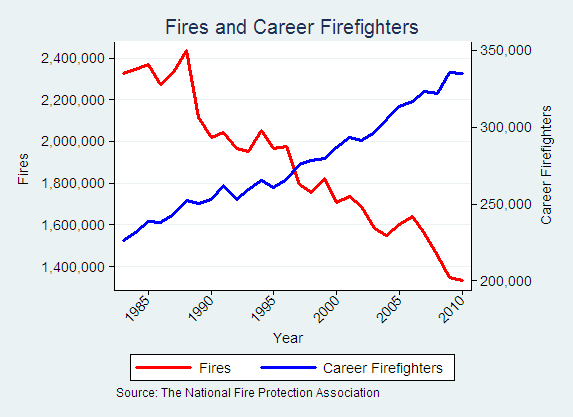 Taxpayers are unlikely to support budget increases for fire departments if they see firemen lolling about the firehouse. So cities have created new, highly visible jobs for their firemen. The Wall Street Journal reported recently, “In Los Angeles, Chicago and Miami, for example, 90% of the emergency calls to firehouses are to accompany ambulances to the scene of auto accidents and other medical emergencies. Elsewhere, to keep their employees busy, fire departments have expanded into neighborhood beautification, gang intervention, substitute-teaching and other downtime pursuits.” In the Illinois township where I live, the fire department drives its trucks to accompany all medical emergency vehicles, then directs traffic around the ambulance—a task which, however valuable, seemingly does not require a hook-and-ladder. Here’s some data. Note that medical calls dwarf fire calls. 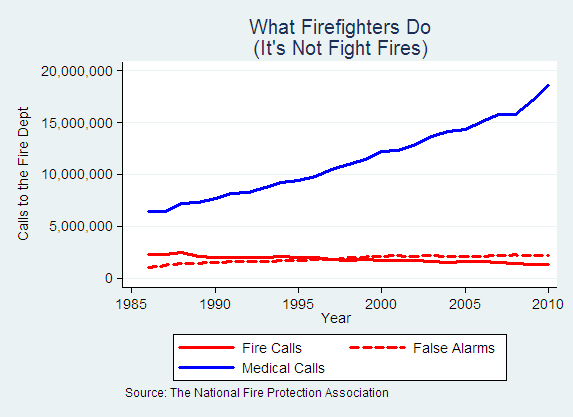 Twenty five years ago false alarms were half the number of fires, today false alarms significantly exceed the number of fires. I wonder when the first multinational company will form its own country to avoid wars, government red tape, and corporate taxes. It feels inevitable. I assume it will involve seasteading. The current notion of seasteading involves floating cities that are outside the control of existing nations. That concept has its appeal, especially as a way to test new forms of government. But existing corporations already have their own form of government called management, and despite its warts, it generally works. Imagine, for example, that one of the world’s beloved companies such as Apple or Facebook someday decides to start its own country on the sea. The company’s existing management structure would need to add several functions, such as education, healthcare, and police. The corporate government would look a lot like the Chinese government. In other words, it would be efficient in terms of profit, while giving up freedoms that employees are already accustomed to giving up. For example, company employees don’t have freedom of speech when it comes to criticizing management. Somehow we live with that restriction and it doesn’t seem too onerous. There would be no taxes for permanent residents of the company country. Public services would be funded from corporate profits. Every paid service in the country, from banking, to insurance, to groceries, would be company-run. The accounting would be transparent and the profits would flow to public services. The big worry with this model is the “company store” abuse that was common during the early days of the United States. In some cases, an employer would take advantage of its monopoly on goods and services to gouge its employees, turning them into virtual slaves. But I think that risk can be addressed by accounting transparency, and by capping the compensation of top management to a multiple of the average employee pay. It also helps if employees can choose to leave whenever they want. That keeps management in line. Wages in the company country would be low while still attracting top talent, so long as the cost of living islow, taxes are non-existent, and the lifestyle is awesome. Employees could earn less while saving far more, especially if they own equity in the company. This prediction assumes that traditional governments continue to bankrupt themselves and strangle their own industries with red tape. That feels like a safe bet. But the main reason a company might want to form its own country is to attract the best minds, and the lowest cost of labor, from all over the world without any immigration issues. (…) Critics are missing the larger point. Why should the Department of Health and Human Services (HHS) decree that any of us must pay for “insurance” that covers contraceptives? I put “insurance” in quotes for a reason. Insurance is supposed to mean a contract, by which a company pays for large, unanticipated expenses in return for a premium: expenses like your house burning down, your car getting stolen or a big medical bill. Insurance is a bad idea for small, regular and predictable expenses. There are good reasons that your car insurance company doesn’t add $100 per year to your premium and then cover oil changes, and that your health insurance doesn’t charge $50 more per year and cover toothpaste. You’d have to fill out mountains of paperwork, the oil-change and toothpaste markets would become much less competitive, and you’d end up spending more. How did we get to this point? It all leads back to the elephant in the room: the tax deductibility of employer-provided group insurance. Scott Adams is a brain food chef, and most of his concoctions are good eating. At the moment Scott is writing pieces about his campaign for US president. His campaign goal is to spread a few ideas. In this context, I see myself as a collector, combiner, and broadcaster of ideas, both good and bad. I spray ideas into the universe and let the ideas fight for their own survival. With the help of their human hosts, the best ideas will evolve and reproduce, and the worst ideas will go to their resting places on the Internet. You’d be surprised who reads this blog, either directly or indirectly. In the new biography of Steve Jobs, there’s a story about Jobs forwarding one of my posts about his brilliant handling of the iPhone antennae issue. I assume Jobs wasn’t normally a reader of this blog, but the ideas in my post that day hopped from host to host until they found him. Each of my posts finds a different path from host to host, depending on the topic and the quality of the writing. I’m explaining all of this because of a comment that user Unlost made about my post yesterday. After reading my ideas for how I would run my presidency, Unlost said, “Priceless, yet this will all go unheeded.” I understand the pessimism, but I see it differently. The ideas I unleashed yesterday are already waging a guerrilla war with the status quo. The ideas are hopping from host to host, and if any are worthy, they will evolve and survive. Change doesn’t happen quickly, but I guarantee that any good ideas generated by this blog – if there are any – will find their way. The weak ideas will fade to backup storage, as they should. I see life as a process, not a goal. If my goal had been to create world-changing ideas that worked right away, I would be a complete failure. But I don’t have that goal. Instead, I have a process that involves seeding the universe with ideas and waiting for the strongest to evolve and make a difference. The worst case scenario is that my ideas cause the eventual best ideas to compete harder and evolve to even better forms. When you use a process that makes sense, even the unanticipated outcomes are good. Why are government rules so complex? A guide to a radically simpler system. No one would design the regulatory system that we have now. No area of it, from environment to education, works as it should. It is unimaginably wasteful, diverting and discouraging legitimate activity of every kind. Another key feature, after simplicity and accountability, would be mandatory sunset provisions for all regulations, since old regulations tend to take on a life of their own. Even good programs can spin out of control. Consider our federal special-education laws, passed in the mid-1970s to end the shameful neglect of the small percentage of students with special needs. Special ed has now grown to consume 20% of the total K-12 budget in the U.S. Programs for gifted children, by contrast, get less than half of 1%. 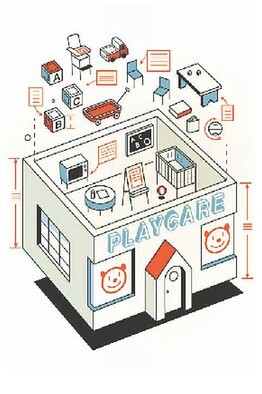 Philip K. Howard, Chairman of Common Good in a WSJ op-ed proposes a radical regulatory overhaul. Howard wants to replace the rule-based nightmare with very simple, goal based language. And every rule to sunset so that Congress has to make fresh choices, including the null choice. One new approach might be to allow independent oversight: Just as most businesses have a CPA who blesses their books, they could have a “certified regulatory expert” to monitor their compliance. Government would oversee CREs but not businesses themselves. This past summer county officials closed down a children’s lemonade stand near the U.S. Open golf championship in Bethesda, Maryland—because the children didn’t have a vendor’s license. Officials decided not to compel the children to go to court, and issued a summons instead to their parents. Local television crews were soon on the crime scene, interviewing the kids who had organized the enterprise as a way to raise money for pediatric cancer. American’s should recall that their constitution is only 15 pages long. How do accomplish the radical surgery? Philip suggests adapting the base-closing model. I agree; allow Congress only a straight up-down vote; no amendments. A radical makeover of American regulation is daunting. Congress can’t even agree on a debt limit, much less recodify several thousand volumes of law. Recodifications through history have always been designed by small committees—such as the small groups of jurists appointed by Justinian and Napoleon for their historic legal overhauls. The best model for us is probably to create new versions of “base-closing commissions,” area by area, whose proposals have to be accepted or rejected in total by Congress, without the opportunity for special interest negotiations. Can you get rich without democracy? Yes if you are an individual, but probably not if you are an entire country. As the figure below shows, there are very few countries that have developed beyond $5,000 in 2005 PPP dollars without becoming democracies somewhere along the way (unless they are an oil economy). This scatter plot covers all countries with population larger than 1 million and with fuel exports less than 50% of export revenues. (Democracy is measured by the Polity score, which runs from -10 to +10). The exceptions in the chart are interesting. Singapore is the most intriguing, of course, as one of the richest countries in the world, but with what Polity considers an authoritarian regime. Belarus is one of the Soviet-era holdovers. Tunisia and Jordan – well, we know what has happened recently in that part of the world. Which leaves China. Will China remain an exception and develop into another Singapore? Or will it go in Tunisia’s direction? My guess is that this question will leave a larger imprint on the world economy than the double-dip we seem to be entering at present. (…) We spend inordinate amounts of time and money determining who will occupy short-term elected positions in government. Once there, people make a living thinking about what these politicians should be doing. On the other hand, we spend almost no time thinking about who will permanently occupy the bureaucratic positions that are actually responsible for implementing governance. The vast majority of the employees of the government, like me, are unelected and – for all intents and purposes – cannot be fired. Focusing on the 0.0001% of government employees that get elected (obviously!) misses the remaining 99.9999%. Virtually everyone thinks that its possible to “change” government while maintaining 99.9999% of its employees. This belief is obviously retarded. (…) In other ways, it’s worse than I imagined. For example, it’s one thing “to know” that bureaucrats can’t be fired. It’s a totally different thing to really understand what this means in a work environment. The change in dynamic in the workplace is incredible. I have colleagues who do no work at all for weeks at a time and everyone knows it. (…) Any tips for those of us who have to deal with government bureaucracy? Any tips for avoiding dealing with bureaucracy? Not really. If you’re dealing with a government agency, figure out what motivates the agency. This is usually easy to figure out, since they are generally motivated by acquiring additional funding. Figure out how they’re funded and you’ll figure out what motivates them. This is more a workings of rather than a working at question, but how does a Department like Education defend itself against its would-be abolishers? Can you imagine a way government could actually be rolled back short of bankruptcy? I don’t think the threat to abolish the DOE is serious – they don’t bother to defend themselves since their funding just keeps going up. Democracies don’t roll back government. Short of bankruptcy then, the only way to roll back the size of government is to move away from democracy. (…) How does accountability work in the bureaucracy? To what extent do tangible results inform policy? Accountability does not work in the bureaucracy. I can’t stress this point enough. The defining feature of the bureaucracy is lack of accountability. It’s very hard to understand the complex ways in which the total absence of accountability affects an organization. If someone really really screws up, they will not be given any new work. That’s about the extent of accountability. BTW, the Foseti essay has provoked a good bit of sharp commentary, such as this. America did not merely secede and copy the governing documents or style of the United Kingdom. Rather, it innovated, creating a system based on the English Common Law, yet different, one with explicit checks and balances to restrain government, and with no place for a monarch. It was an experiment with a more radical form of democracy than existed anywhere in the 18th-century world. And it was an incredibly successful experiment, as the combination of that innovative rule-set and the empty frontier resulted in America growing rapidly in population, wealth, and influence. During the open immigration periods of the 19th century, some years saw over a million new immigrants arrive “yearning to breathe free”. As a result, the new American state had influence far beyond its shores. They are covering a lot of other related material such as the optimal size and number of nations this week as well. Here is a guide. On a related point, I argued earlier for The Great State of Northern Virginia. Finally, don’t forget: If at first you don’t secede, try, try again.